Chicken recipes are a family-favorite of any time of day. 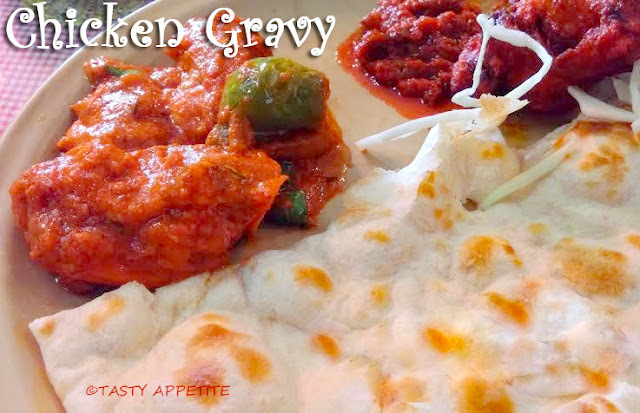 Its absolutely more comforting to prepare homemade chicken gravy recipes to go along with roti for dinner meal. This simple chicken gravy tastes spicy, flavorful and yummy. 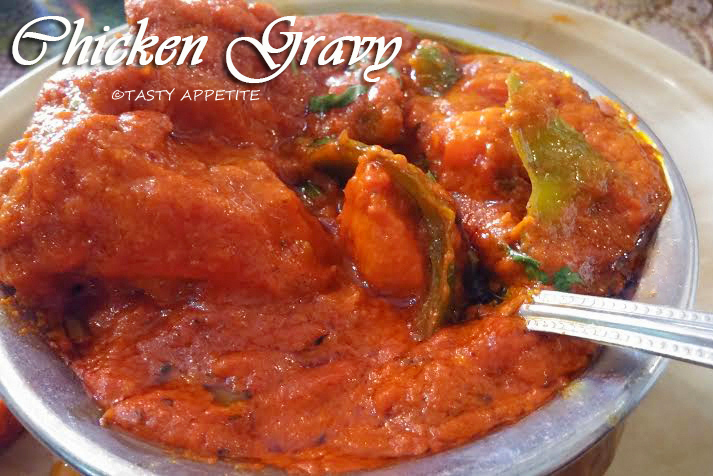 In this recipe the marinated chicken is cooked in red gravy along with freshly ground coconut paste and spices. 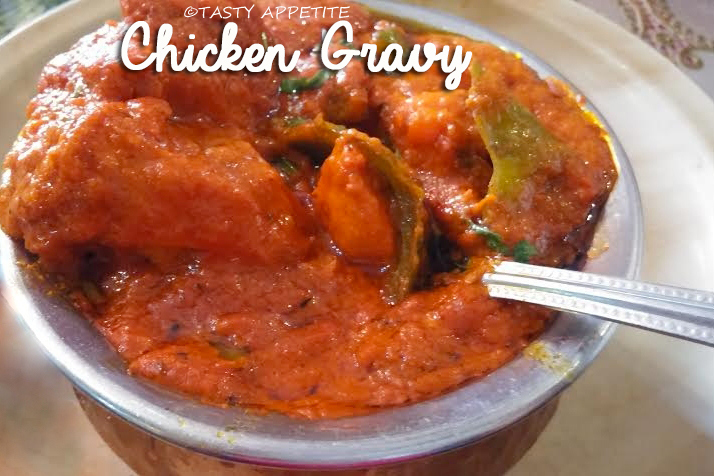 Jazz up your supper with this delicious chicken gravy recipe. 2. Marinate with turmeric pwd, red chilly pwd, turmeric pwd, pepper pwd and yoghurt. 3. Coat the chicken pieces well and allow to marinate for 1 hour. 4. Heat up oil in a kadai /frypan. 5. Add curry leaves, onions slices, green chilly and saute well till the onions turns golden brown. 6. Add ginger garlic paste and saute for a minute. 7. Add chopped tomatoes and saute till they are fully mashed up. 8. Add crushed saunf, cumin pwd, turmeric pwd, kashmiri red chilly pwd, coriander pwd and garam masala pwd. 9. Saute well till everything is combined. 10. Add grated coconut and cashewnuts to blender and grind to smooth paste by adding ¼ cup of water. 11. Add the thick coconut cashew paste to the gravy. 13. 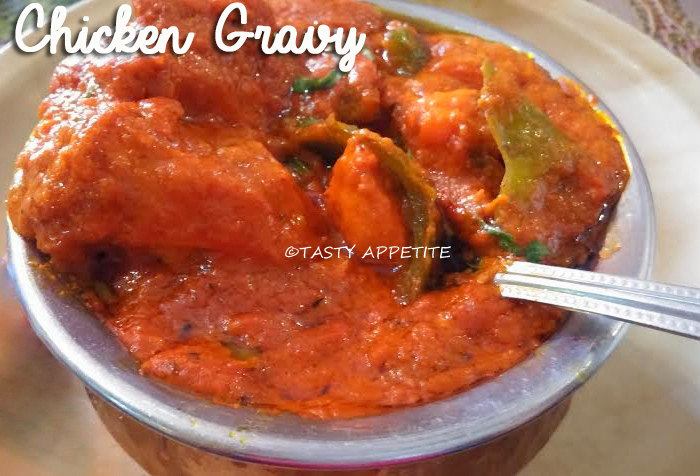 Now add the marinated chicken pieces and spread the gravy on the pieces. 15. Open the lid and stir the chicken gravy making sure not to stick on the bottom of the pan. Add finely sliced capsicum. 16. Cover and cook again for 5 mins. 18. Transfer to serving bowl. 19. Squeeze few drops of lemon juice. 20. Sprinkle freshly sliced coriander leaves just before serving. 21. Serve hot with naan, roti, chapatti or with rice. Enjoy!! !